There is a wild grape that overhangs the South Burlington bike path just east of the UVM Hort Farm that I run by several days per week. Last Friday, June 9, it went into bloom (it was not blooming on my run the day before). Why is this important? Grape berry moth is likely the most injurious pest of grape fruit in northern New England and New York. It is relatively easy to manage, often with a single application of a lepidopteran (caterpillar)-specific material. The first overwintering generation is rarely significant enough to warrant a management spray except in vineyards that have had extreme damage in previous years. 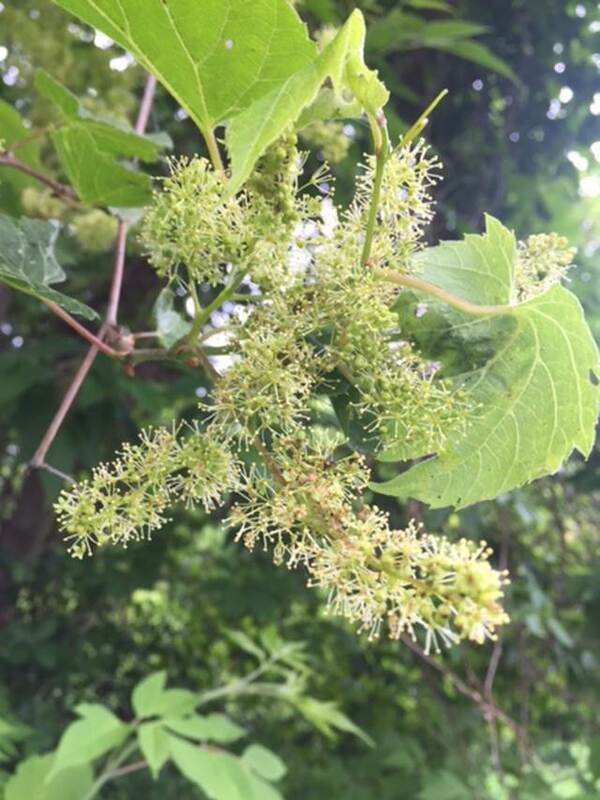 Each generation requires about 820 degree days (base 47°F, or DDb47°F) to complete, and the first generation typically emerges around the time of wild grape bloom. So if we use June 9 as our ‘biofix’ and track DDb47°F, we can estimate the best time to treat for the more damaging later generations. This is made easy by the Network for Environment and Weather Applications (NEWA) system, which I coordinate for Vermont. The network includes ten on-site weather stations (all located at orchards) and six airports, and imports data in near real-time for use in pest models. It is free to use, and growers can locate the site nearest them and develop a best-guess of phomopsis, black rot, and downy mildew infection periods as well as a sense of the grape berry moth generational development. Remember, however the important components of Integrated Pest Management (IPM): cultural controls such as sanitation and good canopy management can reduce disease inoculum and insect pests while reducing canopy moisture and humidity; and most cold-climate grape cultivars are more resistant to the main diseases of black rot, powdery mildew, phomopsis, and downy mildew than V/ vinifera or even older French American and other hybrids with a substantial amount of vinifera in their parentage. So a ‘clean’ vineyard will have less need to spray when a model says a disease infection occurred, and a vineyard of cold climate cultivars is even better off. Remember the basics from our basic spray strategy for cold-climate grapes in Vermont: keep covered immediate prebloom and post bloom, plus another application or two 7-10 days apart after that. Build up from there as needed based on your vineyard history or unique cultivar susceptibility. This entry was posted on Monday, June 12th, 2017 at 9:55 pm and is filed under Grape, IPM. You can follow any responses to this entry through the RSS 2.0 feed. Responses are currently closed, but you can trackback from your own site.